I recently received a cookbook with 50 different grilled cheese sandwiches. Eventually I will try them all! The sandwiches were not named; they were just referenced as Grilled Cheese #1 and so on. I told my husband to pick any one of them out for me to cook and he picked one that had roast beef, Dijon mustard, caramelized onions, and Brie. Go figure, a man picked one that was made with beef. 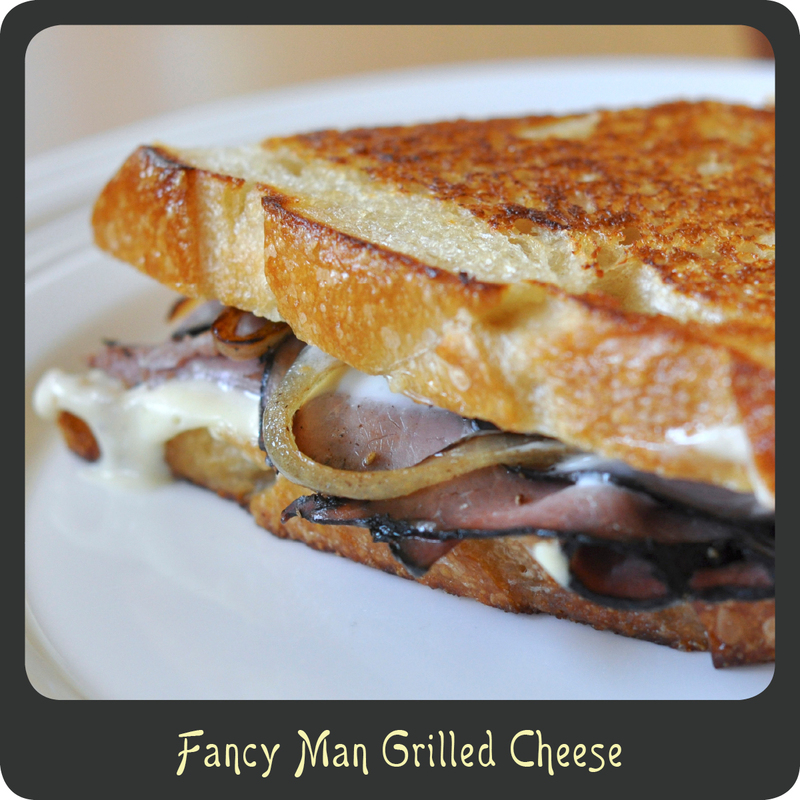 Brie is a fairly elegant cheese so I decided to name this one the Fancy Man Grilled Cheese. Suiting right? This sandwich turned out to be absolutely delicious! The Brie was lovely and it melted to be just the perfect amount of gooey. It was a very nice pairing with the sweet caramelized onions and the heartiness of the roast beef. I really want to try this sandwich again but substitute the roast beef for some green apple slices. I love apples with Brie and think it would be a delicious pairing as well. The sandwich was a hit with the whole family and we will most certainly be making it again. It truly is ooey gooey goodness! Note: I found spreadable Brie by Président that worked fabulously. I didn’t have to deal with the white rind so it was very quick and easy to work with. I’m sure regular Brie would work just as well. This recipe is written for two large sandwiches. Heat a heavy nonstick frying pan over medium heat and add the oil. Once the oil is nice and hot add the sliced onions and stir them immediately so each onion slice is coated in the oil. Allow the onions to cook stirring every 30 seconds or so. Once the browning begins, lower the heat to decrease your risk of burning the onions. Continue to stir the onions every couple of minutes until they are a golden or deep brown. This will take at least 10–20 minutes. Remove the onions from the pan and place in a bowl to the side. Carefully wipe out your skillet with a paper towel to remove any residual bits. On two on the pieces of bread spread the opposite sides with Dijon mustard and then a thin layer of the Brie. Place the bread butter side down in the pan and cook over medium high–heat. Top the bread in the pan with the sliced roast beef and add your caramelized onions. Spread the dry sides of your two reaming pieces of bread with a layer of Brie and top your sandwich with them butter side out. Pingback: National Grilled Cheese Sandwich Day- 10 great recipes!